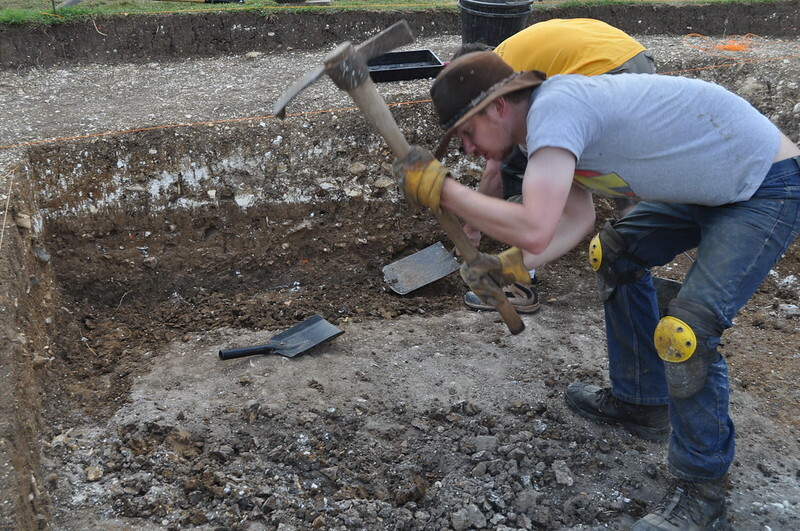 We had 57 people dig in our 1960s trenches over the previous three weeks. Many of them were snapped by me, our photographer Peter Wheeler, or by one of our Student Reporters, whilst we all photographed the various features, sections, postholes and finds. 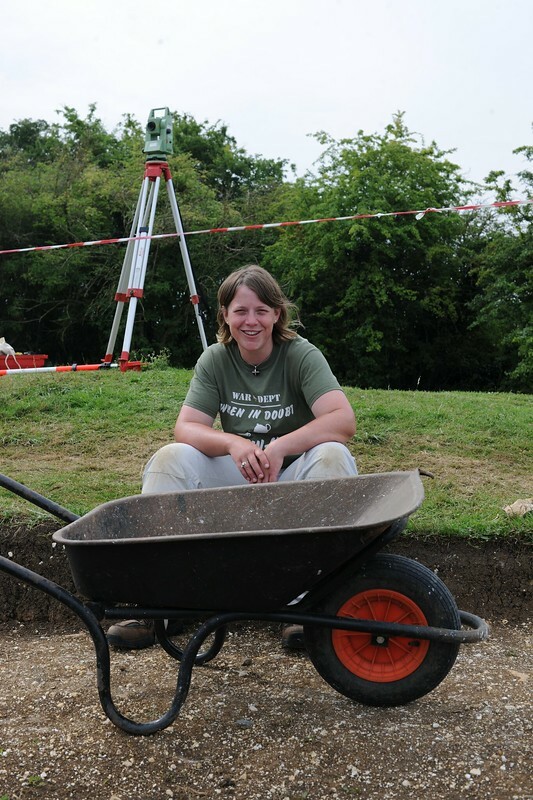 Not everyone was caught on camera, and these portraits are only a small selection of the team that contributed to the excavation season, but we thought we’d share some of our favourite snaps of archaeology in action with you all. You’ll notice that everyone was far too busy to look up from the task-in-hand, so there are lots of shots of the top of our heads! A sure sign that the archaeology was keeping us very busy indeed! Alina, 2nd year undergraduate BSc student. Always cheerful, lending a helpful hand across the entire site. Total station ‘minion’ (her words, not mine) extraordinaire! 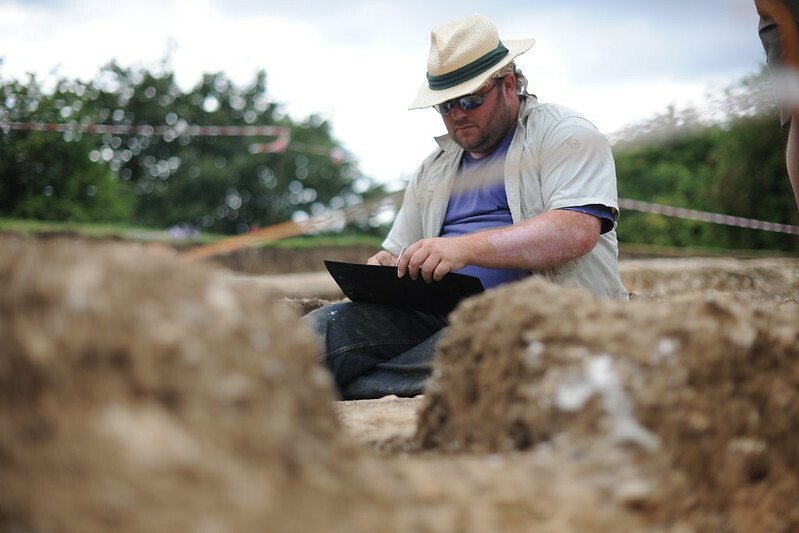 Dan, Archaeological Computing MSc student, and recording genius. No context went unnoticed and documented with Dan on the case. Phoebe, 1st year undergraduate student. Expert icecream serving, meticulous finds marking, and a great sport when it came to dressing up as a Tudor boy for an afternoon as part of the Open Day preparations! Garrard, a volunteer at Museums Service HQ in Chilcomb, and a bones expert. Speedy and accurate post-hole excavator. Dan, a 2nd year undergraduate student volunteer. Dan parties hard, and works even harder. Supported the survey of the Common as well as excavating. Eddie, 1st year undergraduate student. Eddie worked tirelessly on trench 8A with Briony, producing some excellent sections. Christina, Roman architecture specialist. 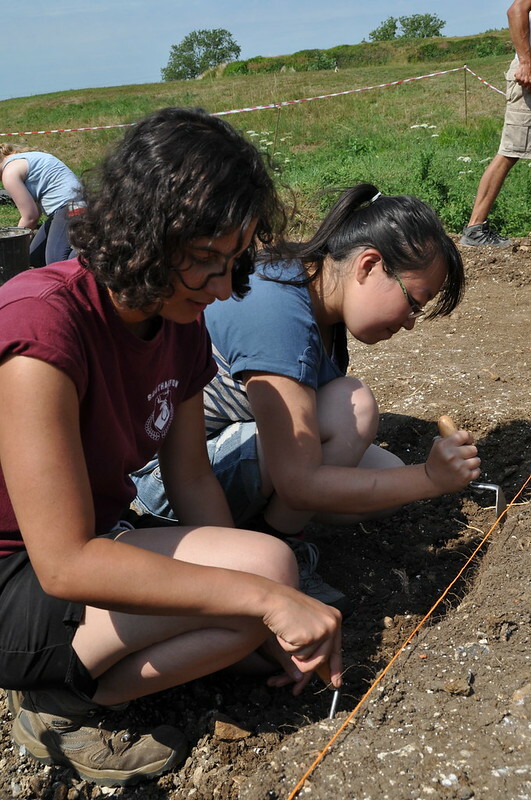 Christina excavated solidly for three weeks, removing the in-fill of an entire trench, and helping students and volunteers alike. Gareth, one of the co-directors of the project. Gareth is a PhD student, researching into the use of 3D visualisation techniques for the interpretation of Roman painted statuary. 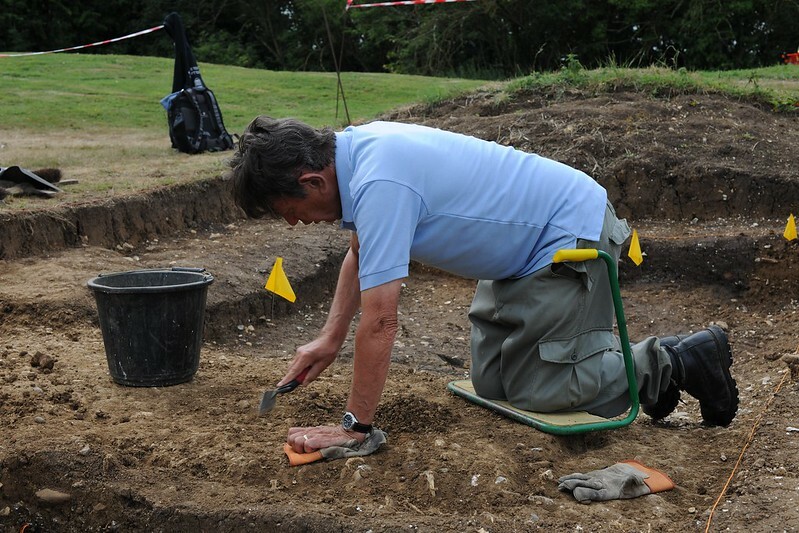 Neil, a locally based volunteer and Basingstoke Archaeological and Historical Society. Neil dug with us for the whole three weeks and was an important contributor to understanding the archaeology of the site. David, a History graduate from the university, and a project volunteer. 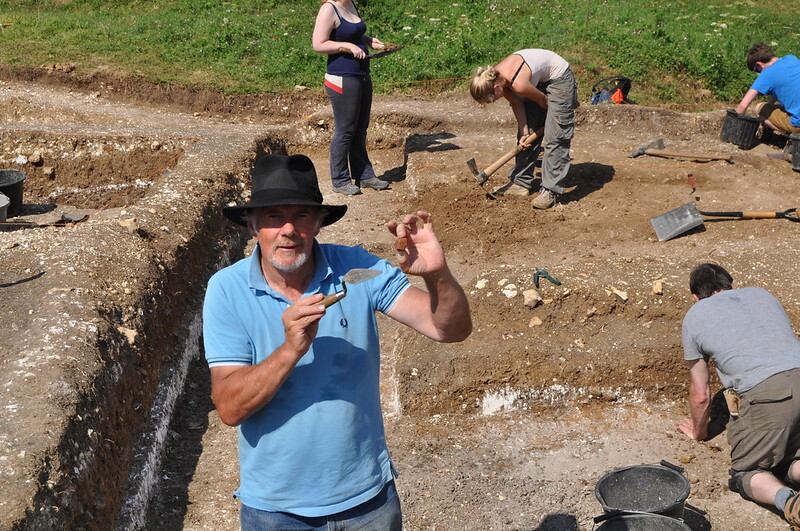 David’s enthusiasm for excavating and keen eye resulted in numerous fascinating metal finds. 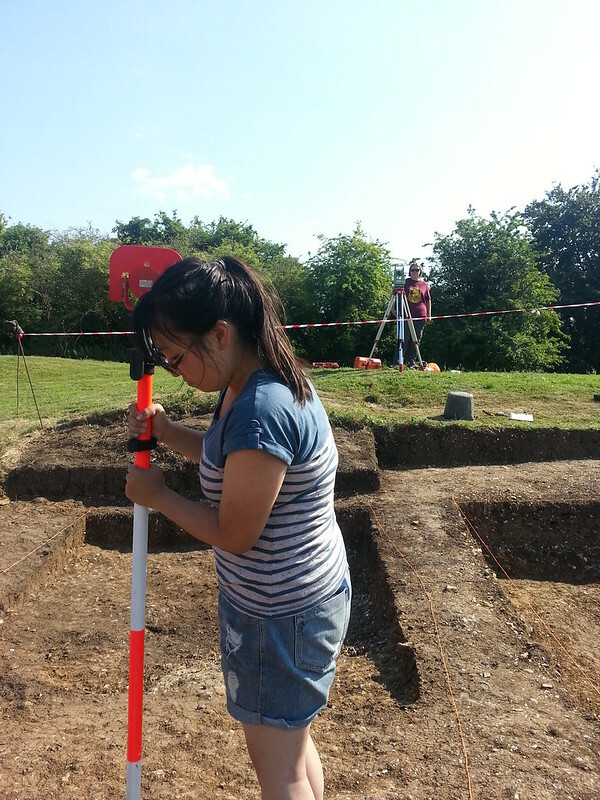 Lizzie, our survey specialist, and also a PhD student specialising in geophysical survey. 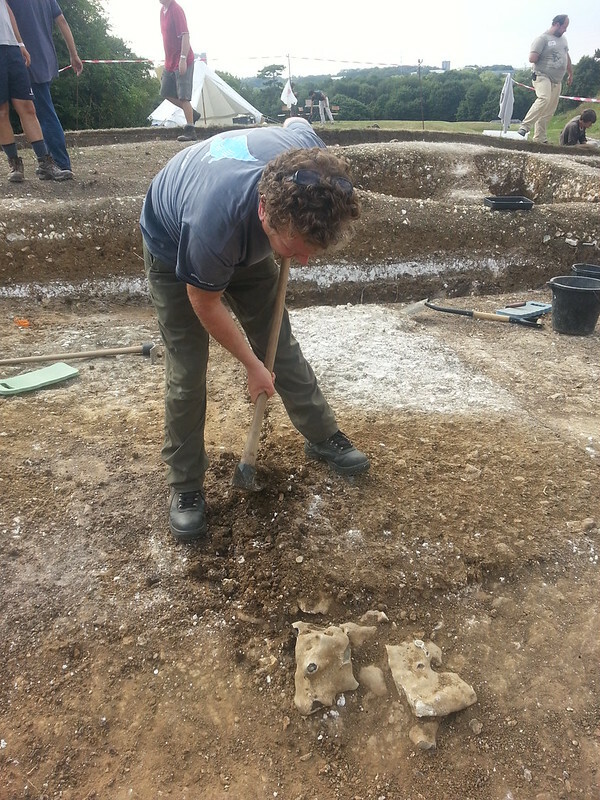 Lizzie worked hard to excavate the large flint feature that we found, and is the finder of one of the Roman coins. Will, 2nd year undergraduate, volunteering with us. Will and Alina supported Lizzie with the huge task of surveying in all levels, edges, and special finds. Jane, a volunteer from the Museums Service HQ in Winchester. Jane excavated one of the centrally located postholes, and on the last day found the metal pieces within the posthole fill. Miriam, a locally based volunteers. 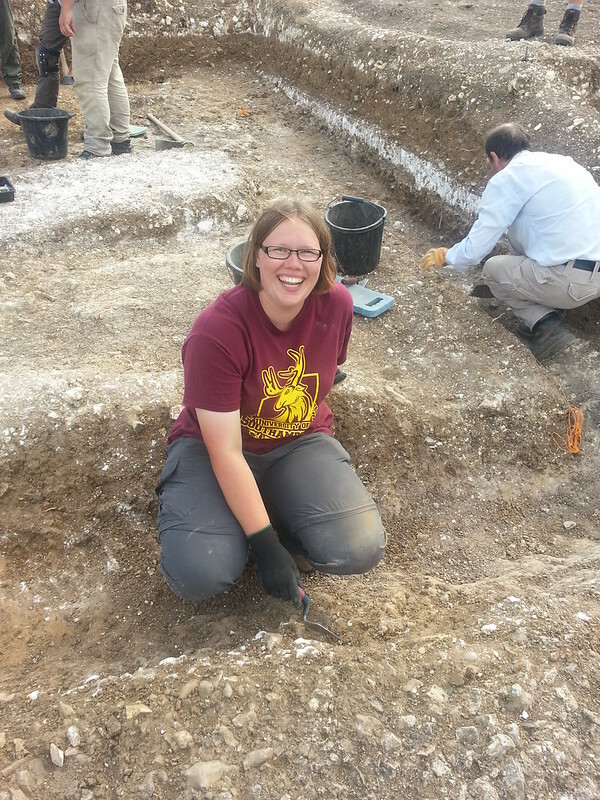 Miriam was one of the youngest diggers on site, and impressed us all with her mattocking and shovelling skills. 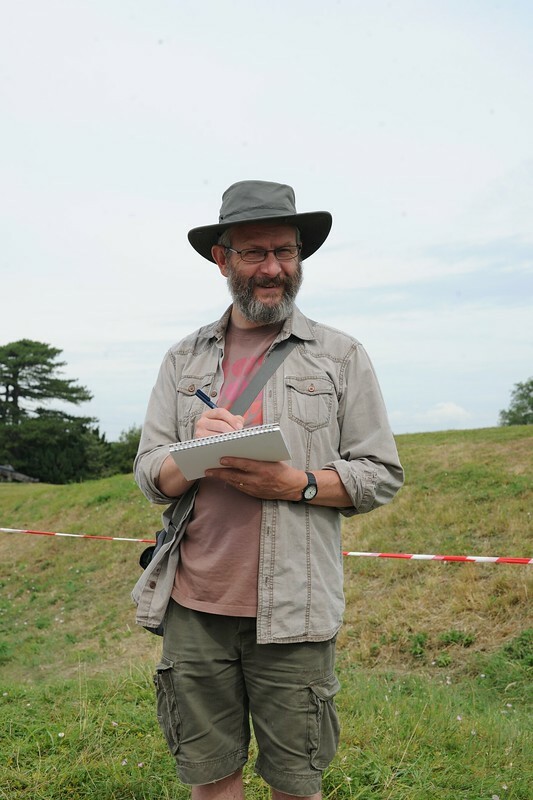 Peter, our Artist-in-Residence, is also currently studying at Winchester School of Art. Peter made some fantastic sketches of the excavation over the three weeks, as well as a series of Zines, summarising the day’s digging. Jamie, a 1st year undergraduate student. Jamie and Sophie tackled the most challenging trench, early on in the excavation. 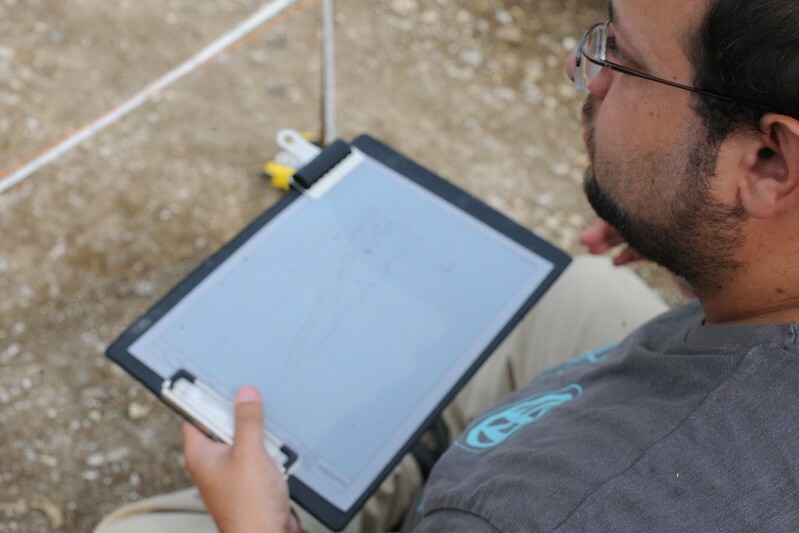 Jamie’s section drawings became a benchmark for the rest of us to aspire to! Andrew, a locally based volunteer. Andrew dug the problematic gully that ran across the whole excavation area. Liv and Lucy, both volunteers from nearby Chineham. 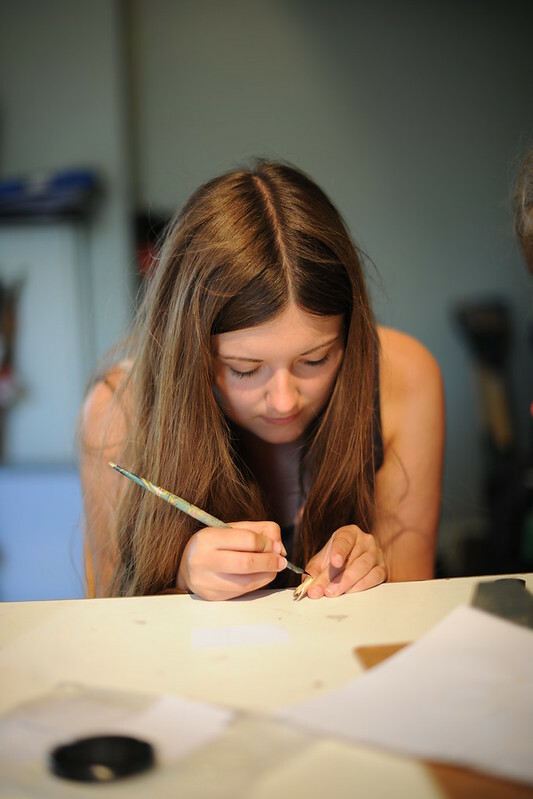 Lucy is studying Fine Art at Loughborough University, and Liv is studying at the University of West England. 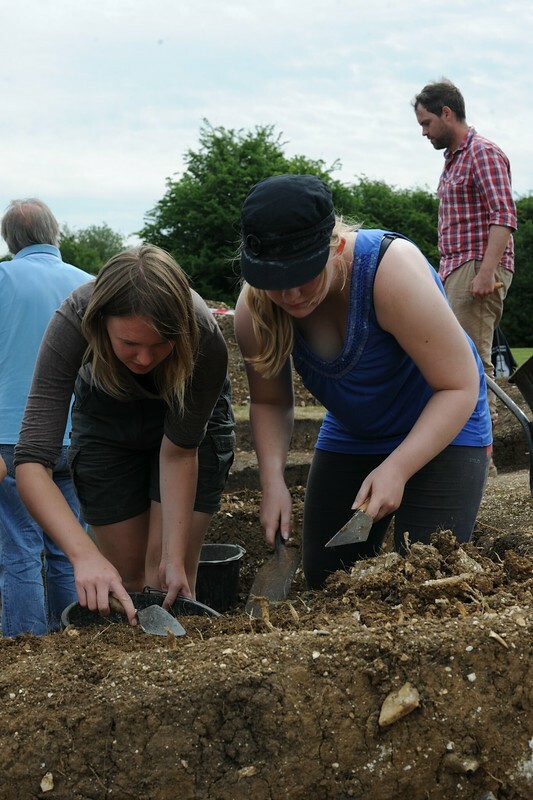 Both Liv and Lucy brought an interdisciplinary approach to the archaeology of the site. 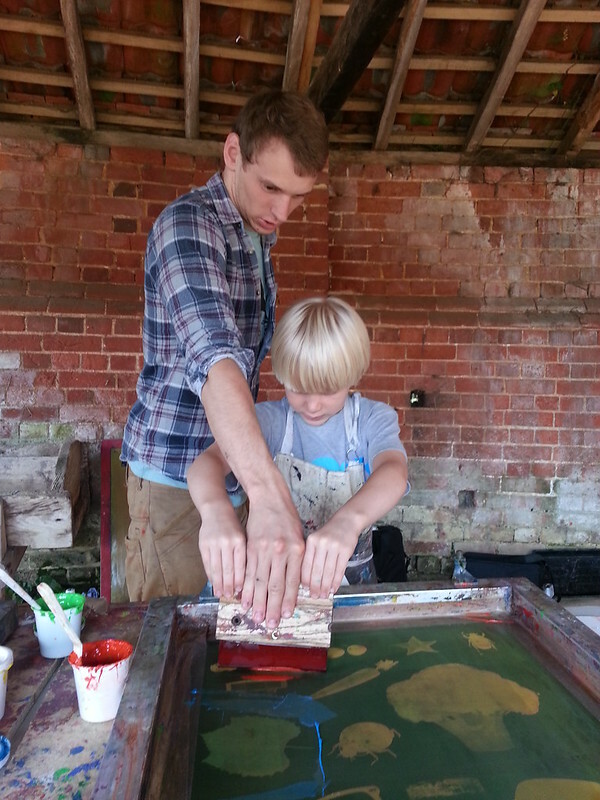 As an art student, Lucy worked with Peter to produce some excellent monoprints. Peter, a locally based volunteer, who helped with everything on site. 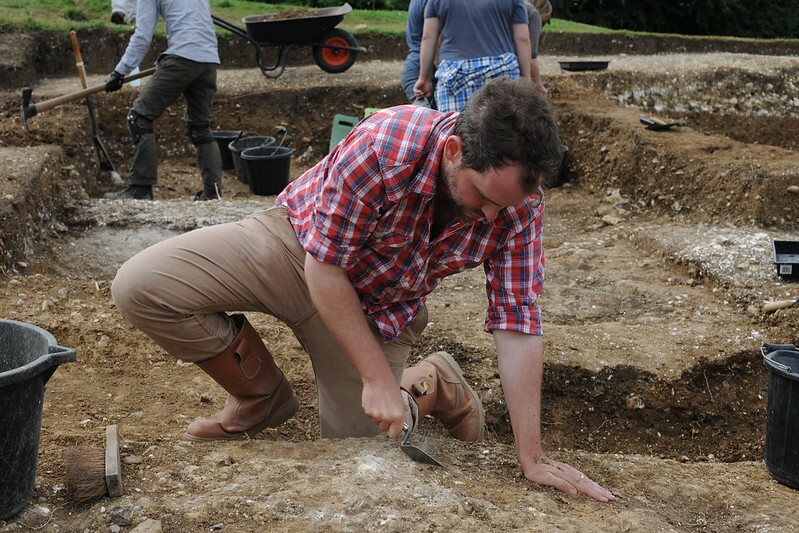 Peter excavated, but also worked on the survey of Basingstoke Common. 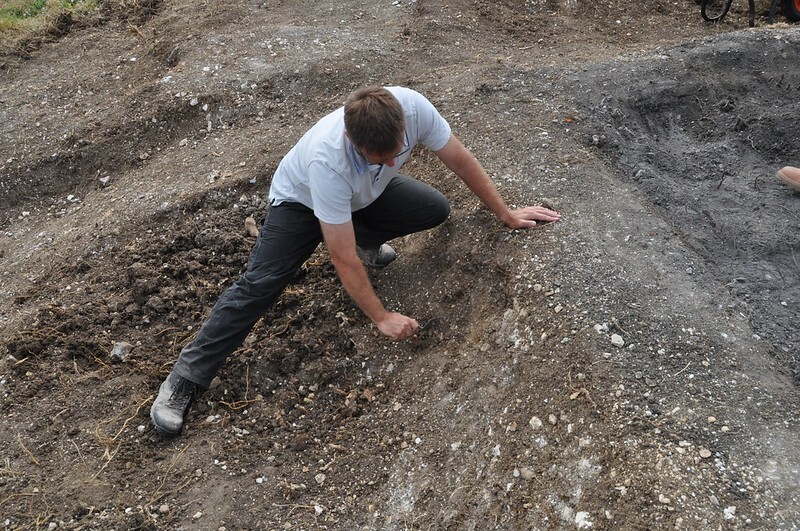 Peter’s previous experience, excavating at the site, was invaluable to our understanding of the trenches, and the site as a whole. Sophie, a 1st year undergraduate student. Sophie, with Sam and Jamie worked hard to produce a final review of the archaeology of the trenches in the final days of the excavation. She is also an excellent producer of section drawings. 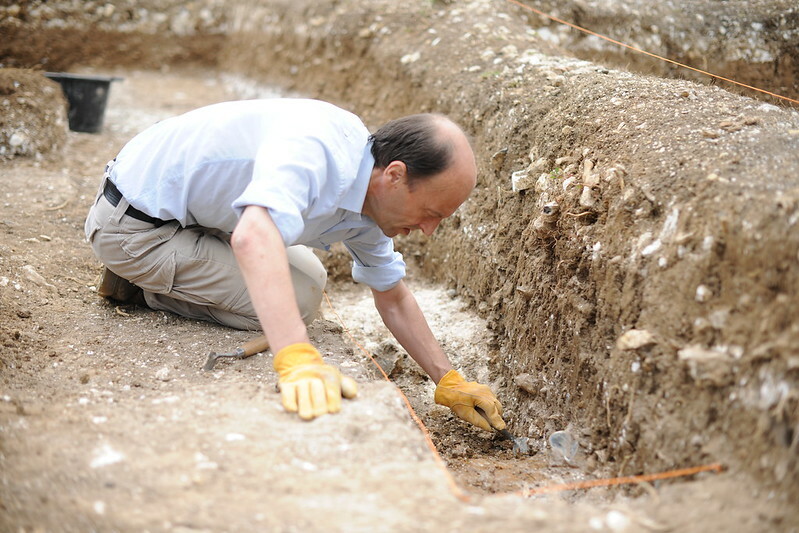 Warwick, volunteer and also Archaeology graduate from University of Winchester. 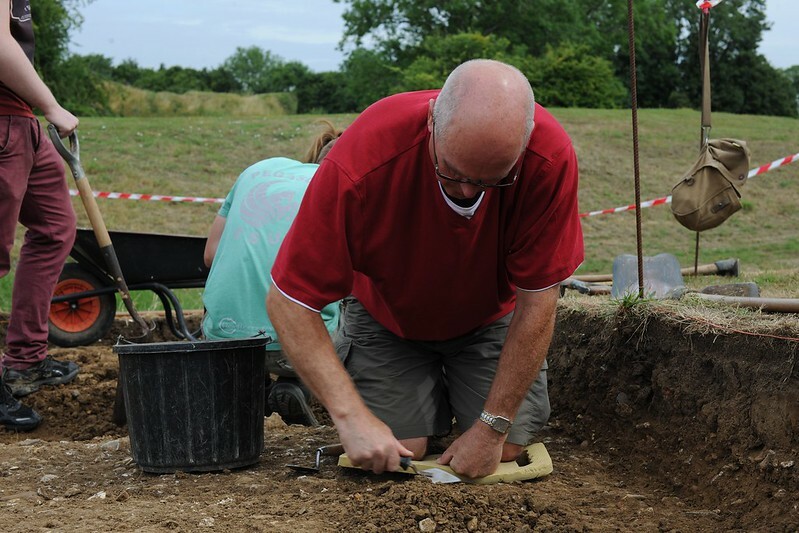 Warwick was our trench action man, always able to mattock away a clay patch that we’d been struggling with – It was impossible to get a photo of him standing still! We wish him all the luck in his future studies! Ian and Michael, both 1st year undergraduate students. 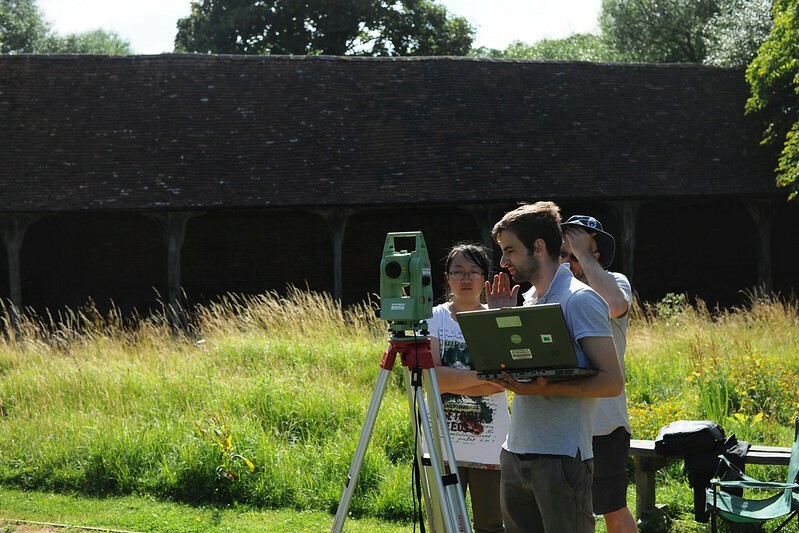 Ian contributed to many of the activities of the project, including the surveying, finds processing, education activities, Open Day stall manning and laser scanning. Vicky, a 1st year undergraduate student. Vicky helped out with much of the digital recording on the site. 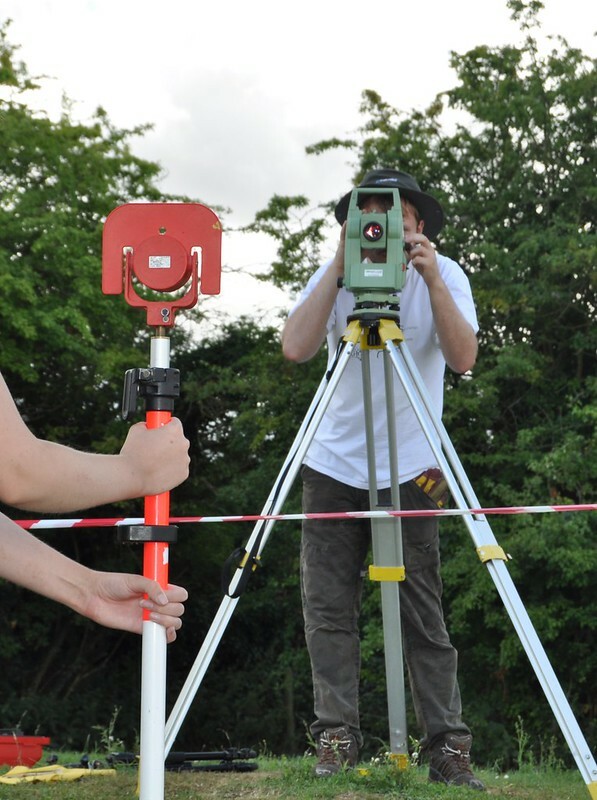 Seen here helping Alina with the Total Station surveying, Vicky also helped on the Common with magnetometry, and even found time to learn how to RTI finds. 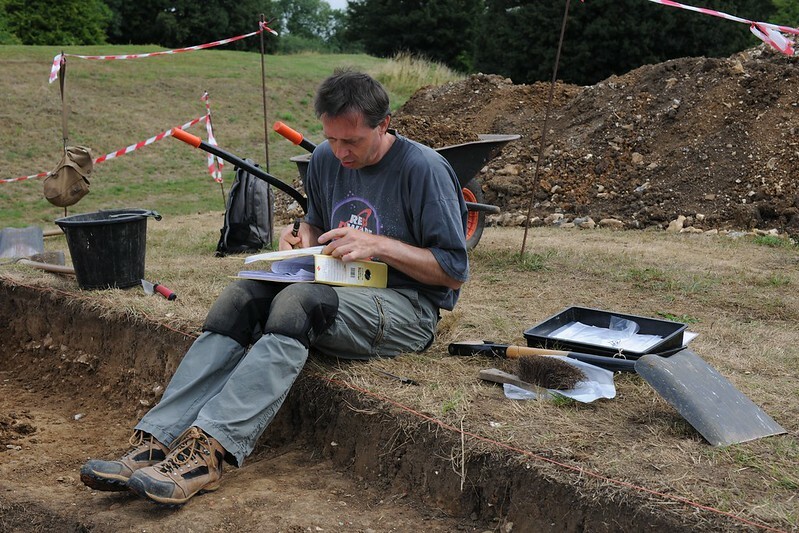 Dave, Co-Director of the project, and Keeper of Archaeology for Hampshire County Council Museums Service. This excavation would not have been possible without Dave’s support. Thanks Dave! Dom, a 1st year undergraduate student. 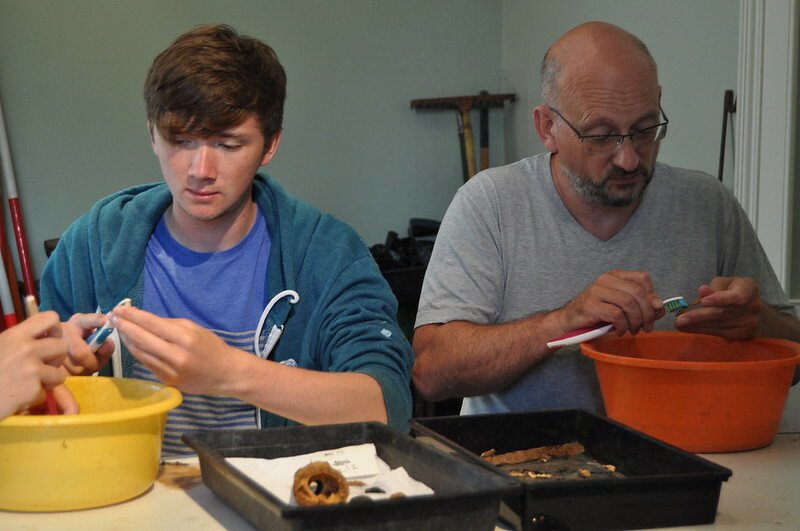 Dom took part in many of the activities on the site, including finds cleaning and excavating. Mike, a recent graduate from Winchester School of Art. Mike came and ran a fantastic day of screenprinting with Jeff and Peter. 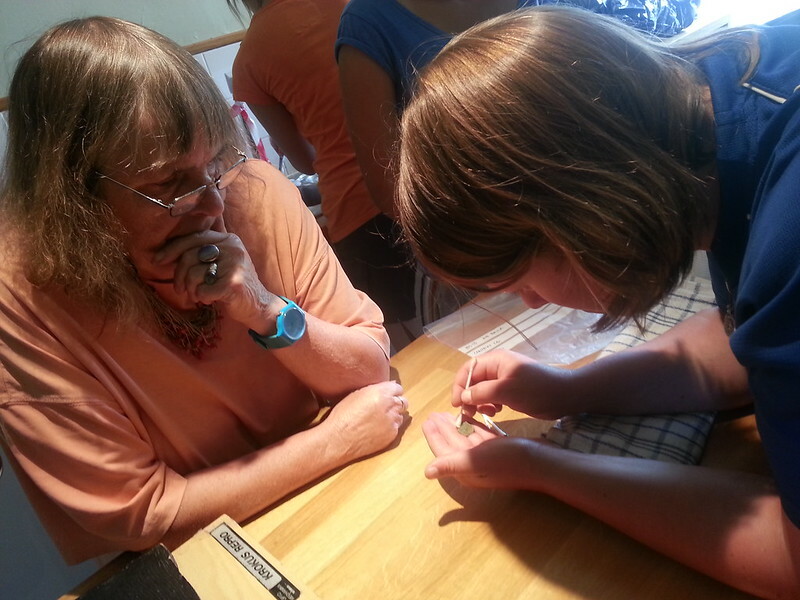 Between them, they helped more than 50 children and adults create screenprints. Pretty impressive output for one day’s work! 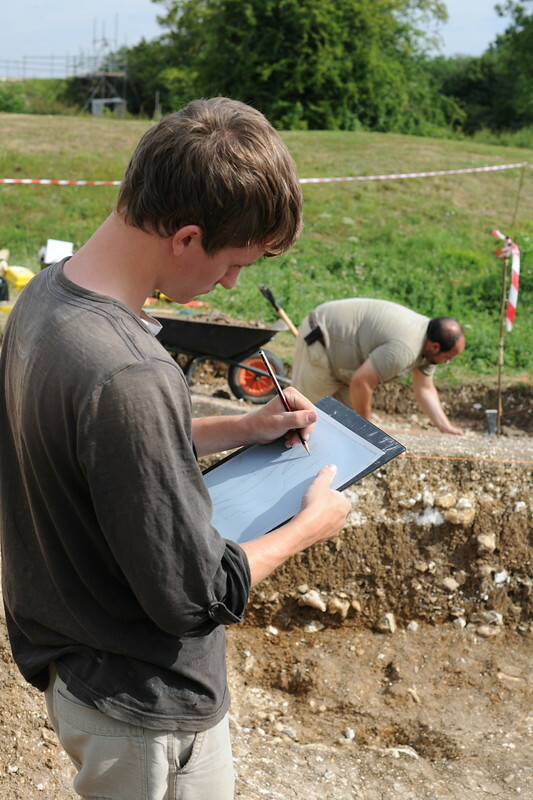 Peter, Archaeological Computing student. Peter set up all sorts of cool recording on site, including producing timelapses of features being excavated, panoramas of the trenches, and aerial photos. He also taught students how to carry out buildings surveys. 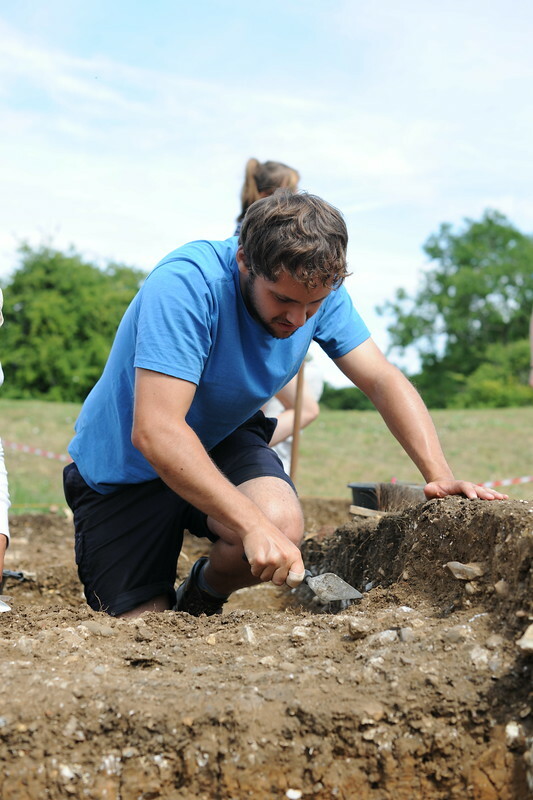 Chris, Co-Director of the project, and also a PhD student studying the relationship between research archaeology, communities and museums. Chris organised the student-led Open Days that we ran as part of the Festival of British Archaeology. Jude, our Finds Specialist. 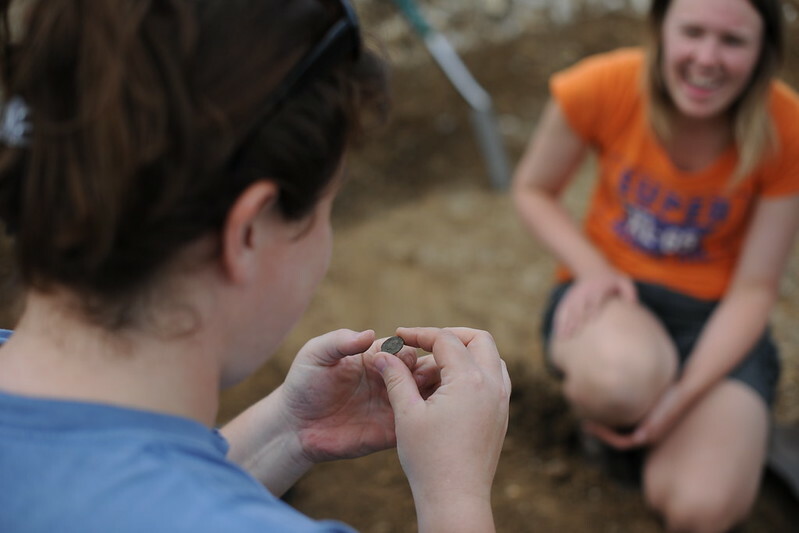 Jude, pictured here cleaning a Roman coin with Lizzie, trained students and volunteers to process finds, and worked closely with Alice to ensure that the finds were all recorded and packed ready for storage by the end of the excavation. Paul, volunteer and also Research Fellow at the university. Paul came onto site to help remove the huge walls of earth that separated the box trenches. 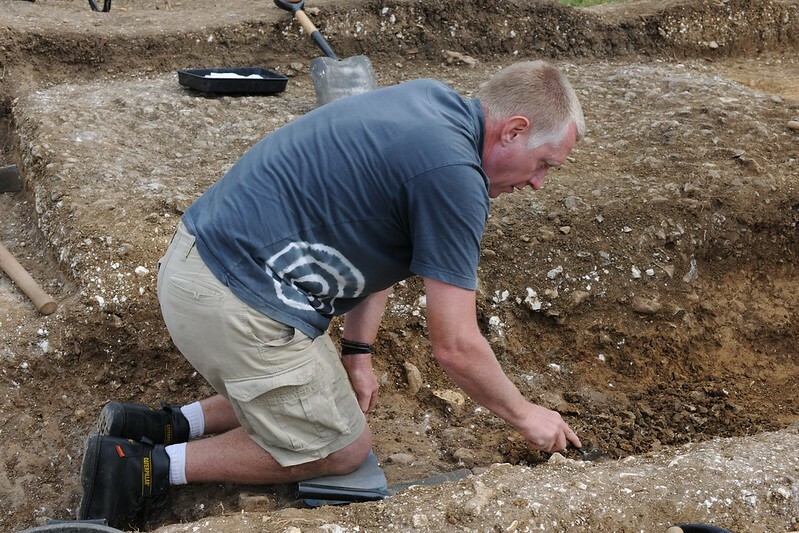 Paul also helped to train the Archaeology students in archaeological excavation methods. Alice, 1st year undergraduate student. 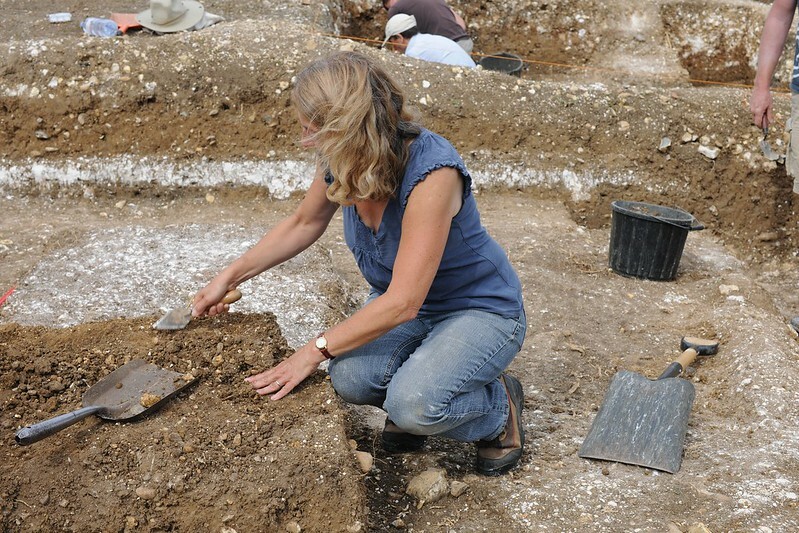 Alice excavated on site, but also was a key player in the family activities ran as part of the Open Days. Alice also singlehandedly added every single find into the finds database. 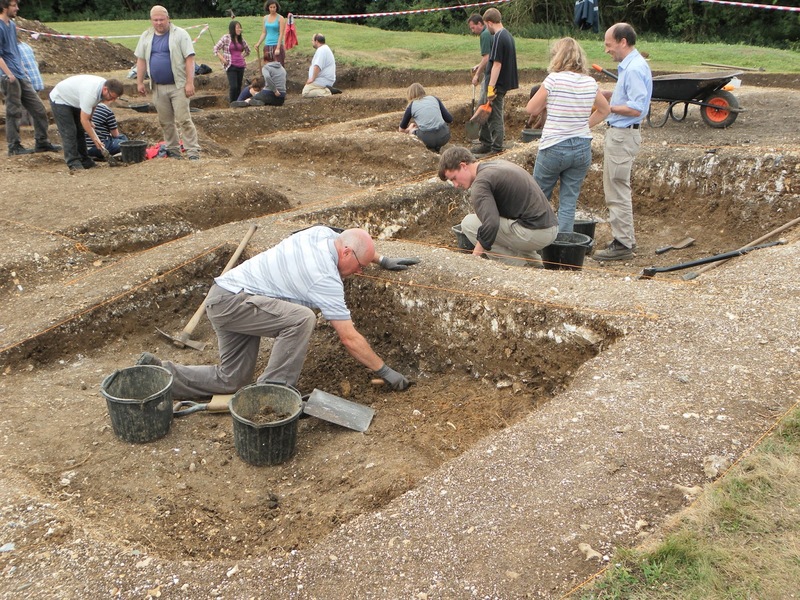 A big thank-you to all of our archaeologists: local and not-so-local volunteers, students, staff from Hampshire County Council, staff from the University of Southampton, members of the Basingstoke Archaeological and Historical Society and also Winchester School of Art staff and students. The excavation could not have happened without all of you!